[09-Nov-2018 03:47:58] ERROR: Aborted by user! No user is logged in at the time to actively abort the backup. I’m not finding anything in documentation about this. We did update to the latest version of the plugin on Tuesday, but the change of doesn’t show any changes that should be causing this. And it is only some sites, not all. What should my next troubleshooting steps be? This topic was modified 5 months, 2 weeks ago by Bet Hannon. Sorry for my delay in getting back to you — didn’t get the notification of your reply. This is happening on some sites that are already have wp cron disabled, and have wp-cron.php pinged by an external service (easycron.com). We are having a few issues with server memory from time to time. Any chance these errors with filesize could be related to that? Again, why would BackWPup be checking for file size of the .zip right AFTER it has been successfully sent to the remote destination? That doesn’t make sense to me. [30-Nov-2018 19:00:34] Database backup done! [30-Nov-2018 19:00:36] 1739 folders to backup. [30-Nov-2018 19:00:40] Added plugin list file "domain.pluginlist.2018-11-30.txt" with 4.03 KB to backup file list. [30-Nov-2018 19:00:40] Added manifest.json file with 6.71 KB to backup file list. [30-Nov-2018 19:00:40] Compressing files as ZipArchive. Please be patient, this may take a moment. [30-Nov-2018 19:27:40] Backup archive created. [30-Nov-2018 19:27:40] Archive size is 247.12 MB. [30-Nov-2018 19:27:40] 11425 Files with 3.94 GB in Archive. [30-Nov-2018 19:33:00] WARNING: Job restarts due to inactivity for more than 5 minutes. [30-Nov-2018 19:33:11] Backup transferred to https://s3.amazonaws.com/bizsites/domain/weekly/backwpup_N2U6HPCX03_domain_weekly_2018-11-30.zip. [30-Nov-2018 19:33:12] One file deleted on S3 Bucket. [30-Nov-2018 19:33:12] WARNING: Job finished with warnings in 1984 seconds. Please resolve them for correct execution. [30-Nov-2018 20:01:17] ERROR: Aborted by user! [30-Nov-2018 20:01:18] ERROR: Job has ended with errors in 3670 seconds. You must resolve the errors for correct execution. I’m sorry that since isn’t a reproducible problem this is taking sometime. First of all thanks for the log informations, seems that from the log isn’t possible to understand exactly what happening. We think could be something to do with the server configuration, for example, are you running a WordPress network with different subdomains located on different servers, or an installation where the configuration is stored into different servers? It is possible to get the informations you can see from the BackWPup > Informations page? We are running some subdomain sites, but they are all on the same server as their main site. Configs are all on the server hosting the site. BackWPup version	3.6.6 Get pro. Server self connect	Response Test O.K. 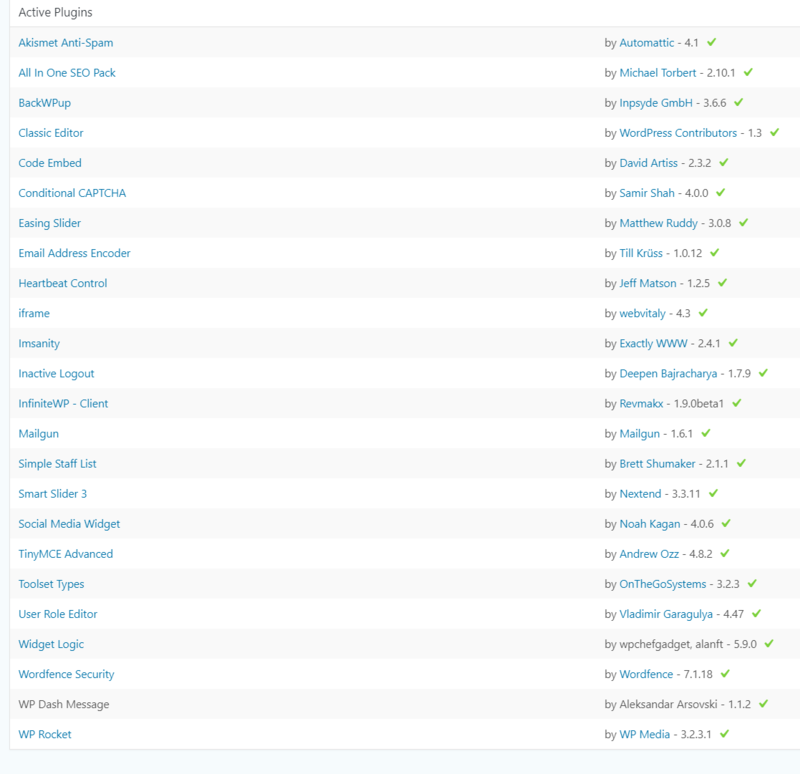 Is it possible to get a list of all activated plugins of the issue site? I just need a list of plugin name. This reply was modified 4 months ago by duongcuong96.